I saw Jon Brion a couple of nights ago. He composed the soundtracks for Punch-Drunk Love, Eternal Sunshine of the Spotless Mind, and he plays almost every Friday night at the Largo. It was a very unique experience, and I am convinced that this man has more musical talent in him than he can possibly hold. He's incredible on the piano, drums, guitar, harmonica, and everything else he incorporates into his set. He plays them like they were extensions of his body. The guy puts so much energy into his show it's almost ridiculous and you kinda worry for him at points, since he's stumbling around half drunk on Guinness (which he drinks like water on stage) and hopped up on heavy doses of coffee. While some of the peppier songs were not so great, he played a few slow ones that made my jaw drop to the floor. His sad songs are soooo beautiful... All in all, Friday night at the Largo is quite an experience. I recommend going there if you're in the LA area. Caught Feist playing the Mod Club over the weekend. Incredible, incredible performance. Not only music-wise, but visually too. 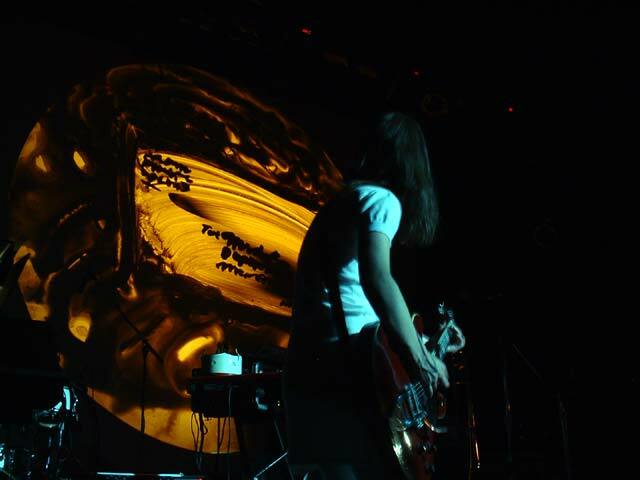 There was an artist on hand that was providing real-time art being projected on to the screen behind the stage. 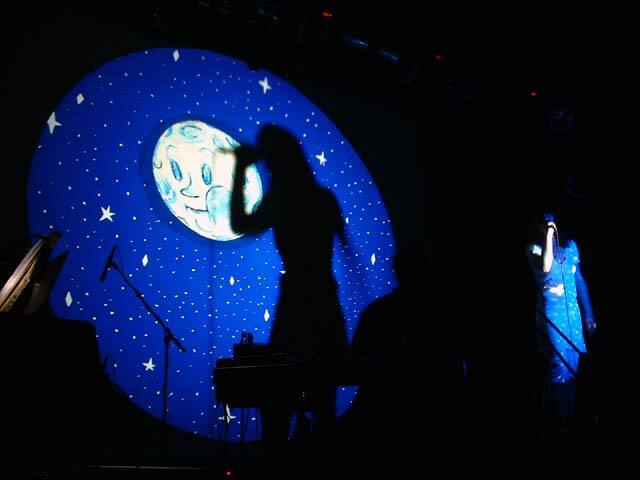 There were a combination of slides, silhouetttes, ink drawings, all interacting with Leslie Feist and her band. It didn't feel gimmicky at all, and it was a phenomenal presentation. Cool pics! I caught a live act of Hoobastank out in Burbank yesterday and they did a pretty good act. I only heard their latest album a few times but it's really growing on me. It's funny how everyone knows them from "The Reason" but their music is not really the type people expect from hearing that song. I would love to catch that dude. I think he'll be there for a looong time. And Kazu, that's terrific, I've really liked Jon Brion's stuff for a while. Well if all goes according to plan, I'm going to see Devendra Banhart tomorrow, and Iron & Wine at the end of the month. I'll try to take some good pictures. Yo, those of you going to Comic Con, Sufjan Stevens is playing at The Casbah in San Diego on July 23rd (the Friday of the con). Joanna Newsom is also playing I think. Vera and I really wanna go, but we may need concert buddies for rides and all that. Also so we won't be lonely concert losers. Anyone? All ya'll who missed him first time round, here's your second chance. jen wrote: Yo, those of you going to Comic Con, Sufjan Stevens is playing at The Casbah in San Diego on July 23rd (the Friday of the con). Joanna Newsom is also playing I think. Vera and I really wanna go, but we may need concert buddies for rides and all that. Also so we won't be lonely concert losers. Yesterday I saw Devendra Banhart, Vetiver, and Joanna Newsom play in Pittsburgh. Vetiver was very nice, but maybe a little too "precious"? The first 3 or 4 songs really had me, but after that it seemed kinda long. I'd definitely like to check out their music though, see if I can get more into it. Joanna Newsom blew me away. I linked some of her music on my site if you want to check it out. She was funny and brilliantly sincere. As for Devendra Banhart.. Much like the Wrens, it felt like his act was about 10 minutes long. He was really amazing, just a terrific live performer. It's also really exciting to hear the songs from his first album--because they were recorded in loving low fidelity, there's just no comparison to how nice it sounds live. He's completely charged, and a little crazy. "High on life," I think they say. Neil wrote: I linked some of her music on my site if you want to check it out. Oh, you can also hear two other tracks on her site, http://walnutwhales.com. It's all good! Sure. Count me in for a little Sufjan too. Soccer Mom Kazu can drive us around! Yay! Although, we must also find a place that will involve a little shaking of the booty. I will probably feel the need to shake it a little while I'm down there. Joanna Newsom blew me away. Aw, that makes me excited. I haven't heard a lot of her, but what I have I really really like. Man, what a cutie.